The walls from our house. 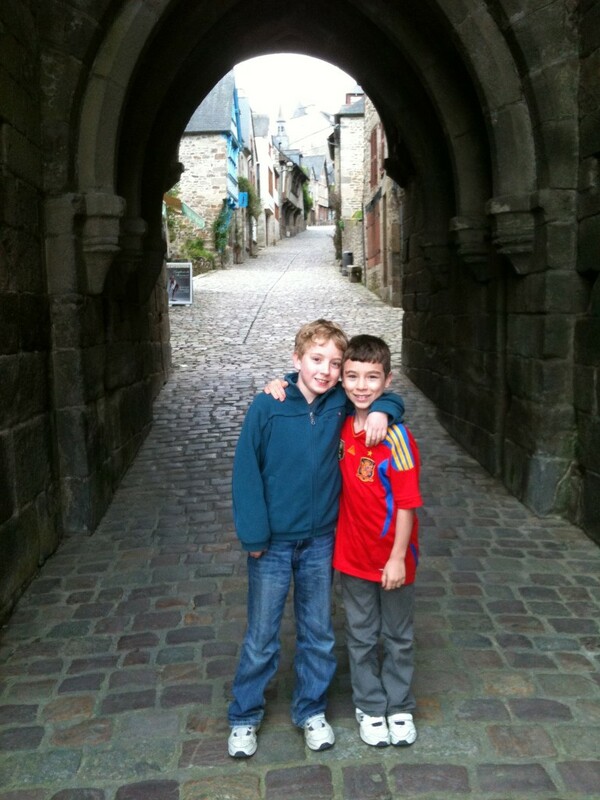 Visiting Dinan is little bit of a Harry Potter experience. It’s quite a large modern town until you come to the old town walls. Then suddenly you’re in a Diagon Alley of 13th and 14th Century half-timbered houses clustered around steep cobblestone streets. 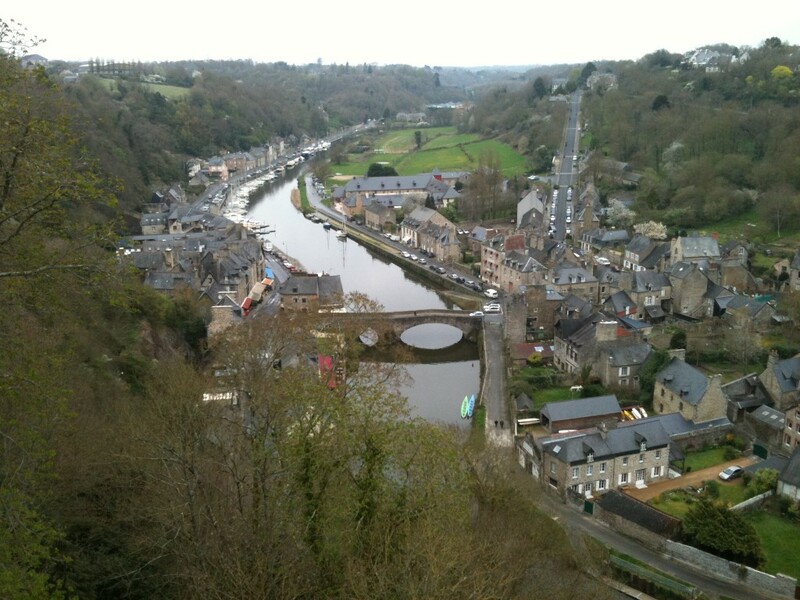 Looking down on Dinan port. We’ve moved from the hot wine-growing county of the middle of France to the wetter, greener fields of Brittany. Brittany is more grey stone, solid construction meant to keep out the cold Winter winds. It has square houses and towers where Sancerre had round ones. The smell of sea and cows wafts on the air instead of flint and burning vines. In a few hours we’ve come to quite a different place. Our house butts up against the ancient battlements to the South of the town. Although it’s of heavy stone construction I imagine it would have been one of those abandoned and destroyed if the walls were ever threatened. 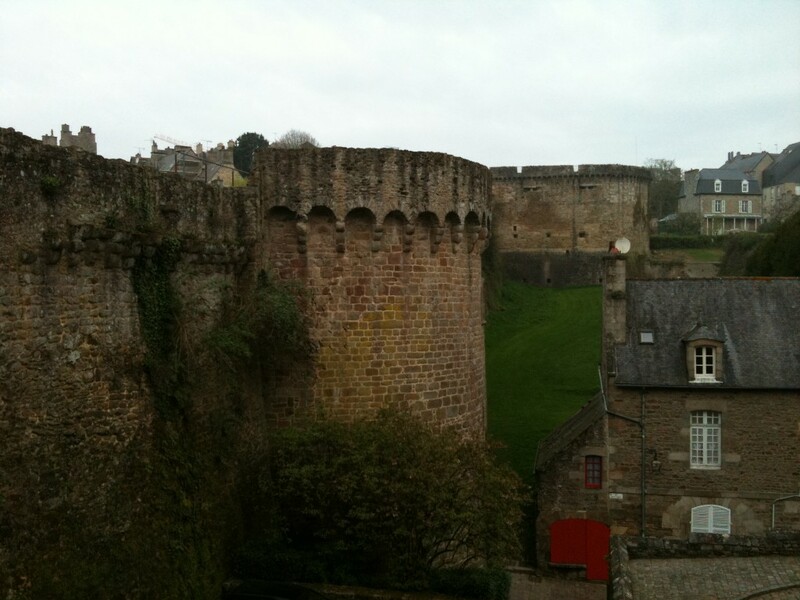 As far as we can determine though, the walls of Dinan kept the town safe and secure for most of its history. As a result the town is quite lovely but lacks any dramatic historical event to hang your hat on. The most quoted event was a single-combat between knights in the 13th century which took place where the town car park now sits. The gate behind our house. The old town sits largely on the escarpment above the Rance River. The river has done a fine job of eroding a deep, deep valley and so descending to the river means going a long way down. 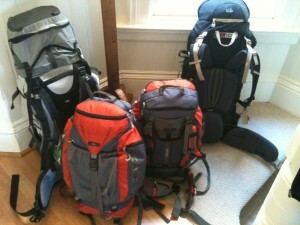 It’s not very far, but it is steep. The walk takes you to the port of Dinan on the river. There, under a soaring viaduct, we found a lovely little bridge, riverside tracks and some great little restaurants and patisseries. We stopped for morning tea – Jennifer and I tried Kouign Amamn, which is a Bretton butter cake. It’s made of layers of butter and cake with caramelised sugar. The sort of thing you can imagine them using for energy when fishing in the North Sea in the dead of Winter really. It was still yummy sitting beside the river in the sun though. 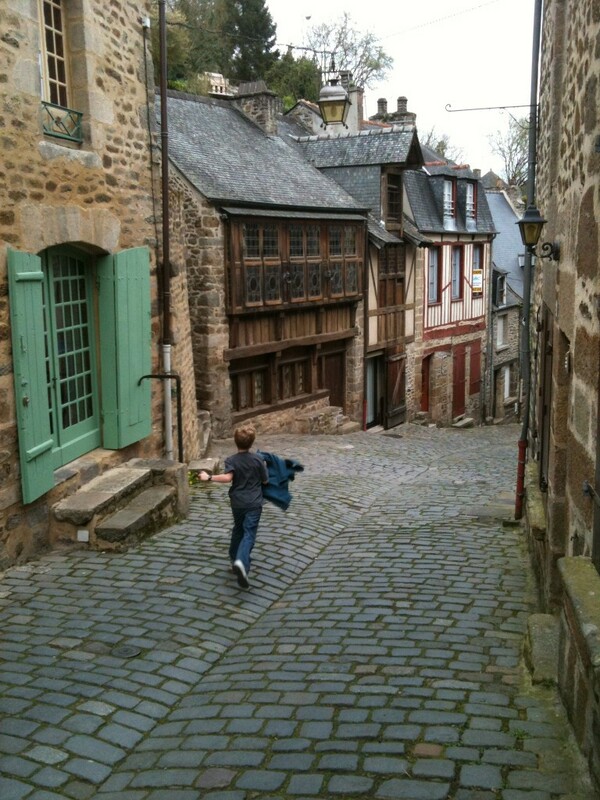 Dinan is just as magical as we remembered and people reported. Funnily though after two weeks in tiny, sleepy Sancerre it seems quite bustling and busy. We even heard some tourists speaking English today – which caused a frisson of excitement. Our own French must be improving as we managed to have a long conversation over dinner tonight with the proprietor of the restaurant we ate at – and he didn’t resort to English once. It was also our first meal outside in a long time. The beginning of daylight saving has made just enough difference to the evening temperature that dinner on a terrace by the river was completely comfortable.